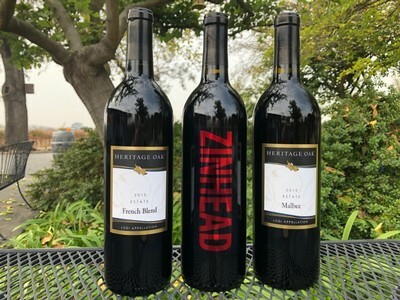 If you'd like a detailed description of the wines, and a video blog with Jim ... please CLICK HERE to visit the club section of our Web page. If you are going to be in the area the first Saturday of December, Carmela and I invite you to enjoy our winter release party. Stop by and check out the recommended wines and have a bite to eat. The event will start at 1:00 PM and we will be serving hot soup, bread and salad for lunch to club members and guests. As well, we have great music planned for the day. From 1-4PM we’ll have the Whiskey Slough Band here performing for the first time. They're a local Lodi band, and play all-original blues and blues-infused rock. If you think you'd like to attend, please drop me a line to tell me how many are in your group. A reply to this email will be fine, or you may also call or text me at (209) 986-2763. If your quarterly wine is shipped to you, we are planning on shipping out on Monday, December 10. If this date does not work for you please let us know of a better time. If you'd like something other than what we're suggesting, you are now able to login on our website (using the email you have on file with us as your username, and heritageoak2018 as your temp password - you can change that). Once on your account, you'll have the recommended wines pre-chosen for your club shipments, but you can now make changes if you'd like other wines. Feel free to email us your selections too, if that works better for you, otherwise we will send you the recommended wines we chose. Please make all changes for your Club shipment (choosing wines, request to delay shipment for a different date/address, hold this quarter's wine club shipment, etc) before Monday, December 3rd. Credit cards will be billed that week for shipments.